The Lorenz curve (1) is tool in statistics to visualize the concentration of values within a dataset. 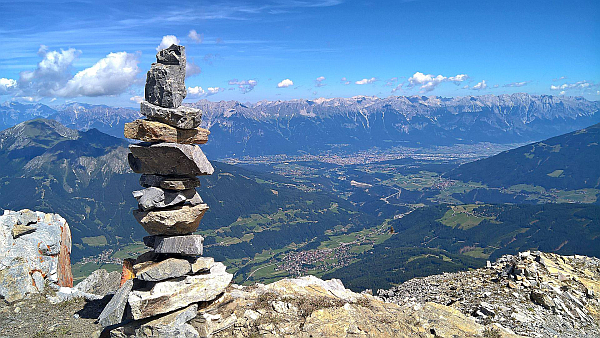 A typical well known example is the concentration of wealth within the population. For example in 2017 the top 1% of the US population controls 36,8% of wealth (2). 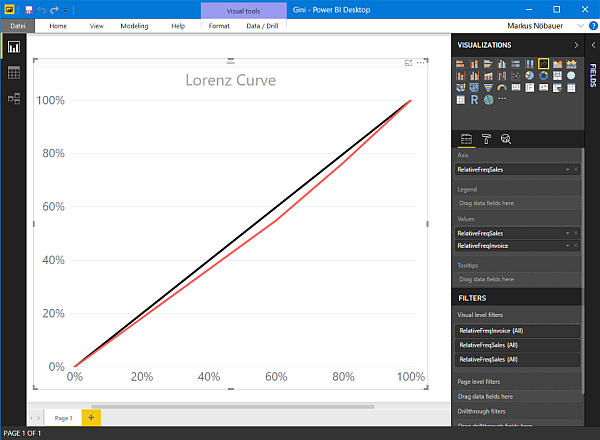 However, the Lorenz curve can also be utilized to visualize the product groups share on revenue. The invoices are stored in a separate table called Invoice, it contains three columns: The ProductGroup, SalesId and InvoiceAmount. Now comes the tricky part. A SQL statement is required which creates the cumulated sums. To do this the SQL function row_number is used to create a line number in the result set. Then the same result set is joined with all records smaller or equal the current row number and the InvoiceAmount is summed up. The SQL Statement looks like this. The next step is load the data into Power BI and calculate the relative cumulated frequency for Sales and Invoice. The is done by diving the cumulated frequency by the total numbers. After this there should be a dataset with the values from the table above in Power BI. Add two additional columns.to calculate the relative cumulated frequency. Format the columns as percentage. 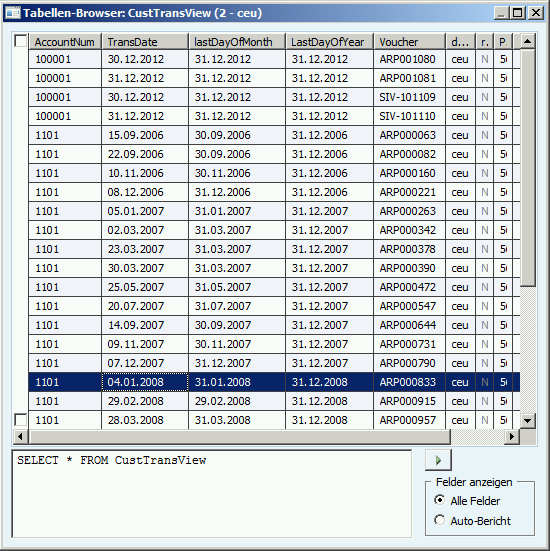 View Computed Columns in Dynamics Ax 2012 support the use of TSQL functions to calculate additional view columns. Here is an example how to calculate the Last Day of Month and Last Day of Year based on the TransDate at the CustTransView. First, Extend the SysComputedColumnDatePart Base Enum and add two additional values Month and Year. 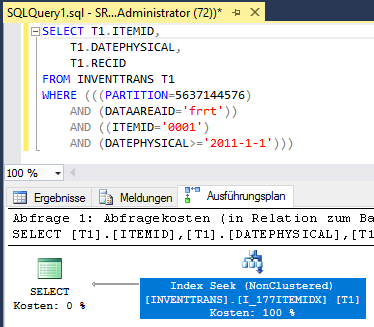 Extend the getDateDiffFormatSelector() method at the SysComputedColumn class. Add a new static method to the view and call it lastDayOfMonth. 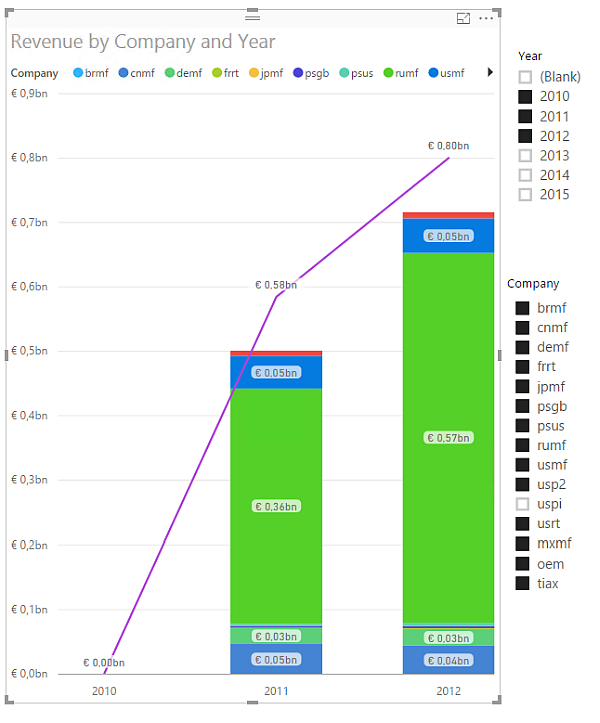 We recently discussed at work how to display the contribution of multiple firms to the total revenue in Power BI, in a way that the firms can be filtered but the total revenue stays constant. We came up with a very simple no-code solution. 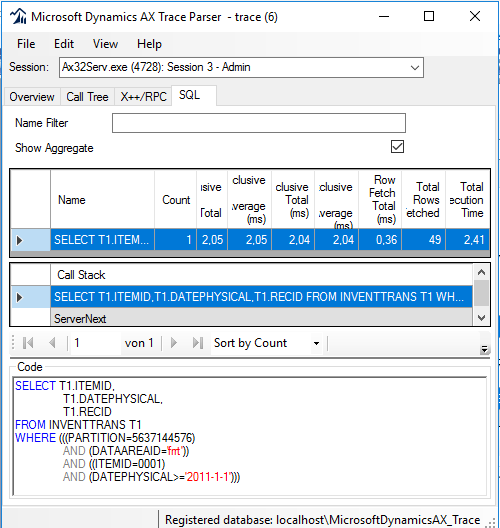 All the required data can be fetched from the CustInvoiceJour table in Dynamics AX. 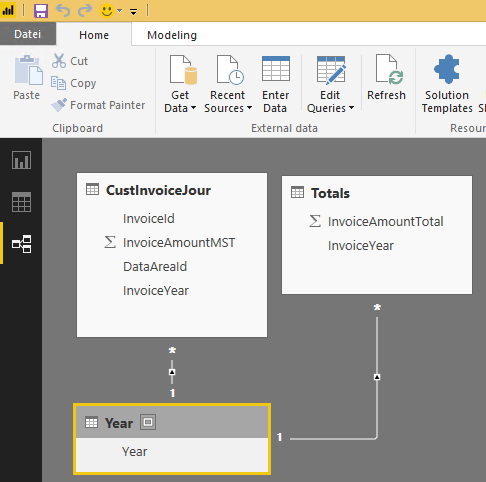 There are three datasets in the Power BI data model. First, the invoices including the InvoiceAmountMST, InvoiceYear and DataAreaId. Second the sum of InvoiceAmountMST grouped by Year and DataAreaId. Finally, a table that contains the years. Here are the SQL statements to load the data. 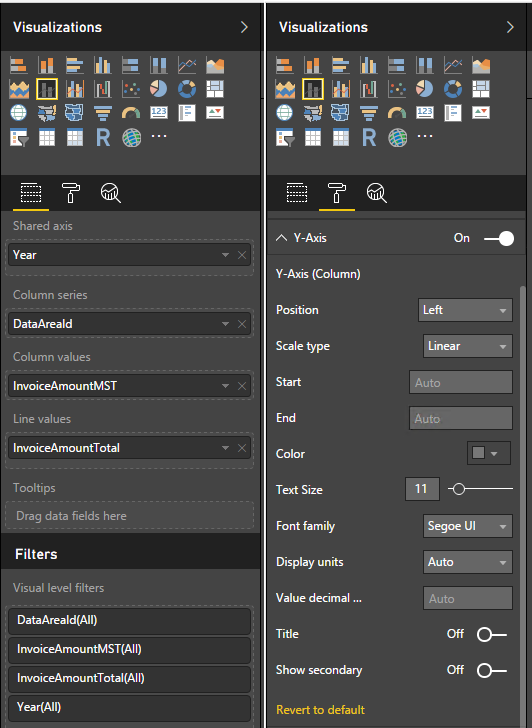 In Power BI create a new dataset and enter the years manually, like 2010, 2011, 2012, etc. Add a new Line and stacked Column chart to the Power BI Report. 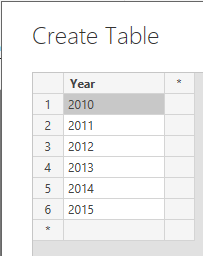 Set the field Year from the Year table as shared axis. From the CustInvoiceJour set the DataAreaId as Colum Series and the InvoiceAmountMST as Column values. Set the InvoiceAmountTotal from the Totals table as line values. In the format tab disable the Y-Axis property Show Secondary. Your diagram should look like this. Filtering the companies does not effect the total revenue line. 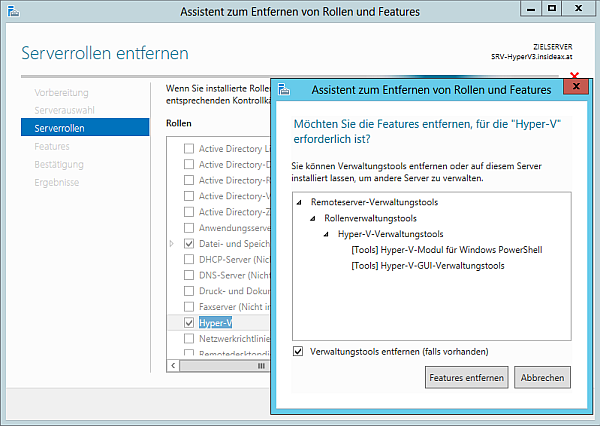 Next uninstall the HyperV role using the Server Manager. 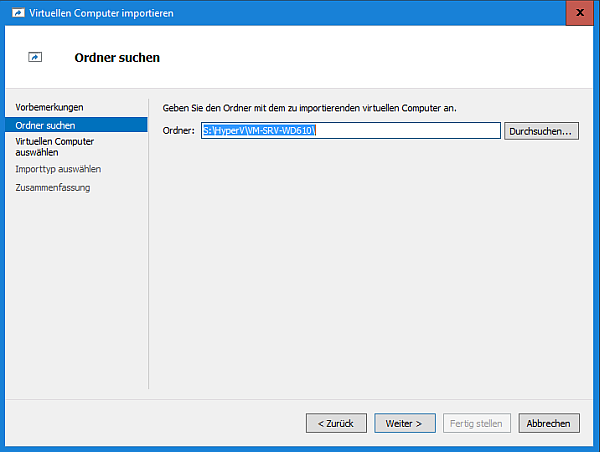 Simply select remove roles and features and select the HyperV role. 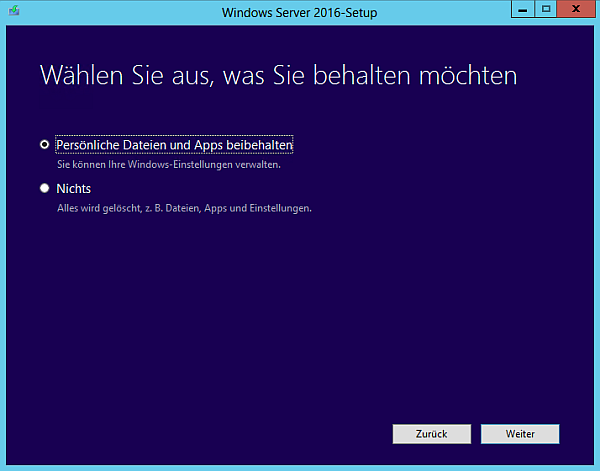 This step requires a reboot and your server will come up a simple plain windows 2012 server. After HyperV was uninstalled make sure to remove NIC teaming in case you are using this feature. 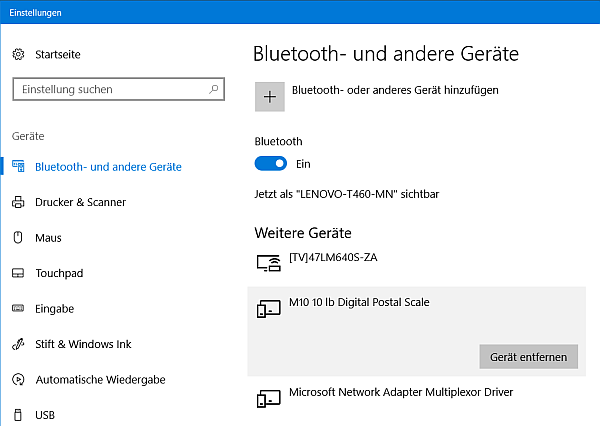 I recommend to deactivate all but one network adapter. This can also be done using the Server Manager. 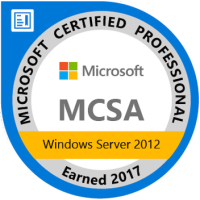 Insert a disk or mount the Windows Server 2016 image. Start the upgrade process. When asked choose to keep all your data and apps. This will preserve your data and applications e.g. the RAID Manager software. The setup wizard warns you that an inplace upgrade is not the preferred way to setup server 2016. Accept and proceed. The upgrade will take a while and requires some reboots. After the upgrade process has finished, its time to setup HyperV again. First configure the NIC teaming again. 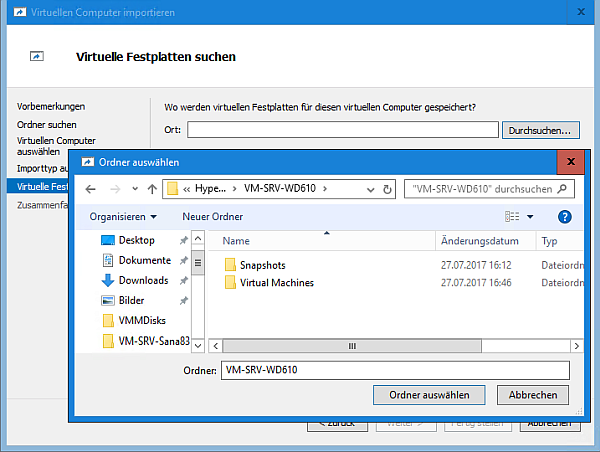 Activating the HyperV role in Server 2016 is almost the same as in Server 2012. This can be done by using the Server Manager installing new roles and features. Activating HyperV will require a reboot. After the reboot configure a virtual switch so your VMs can access the network again. By default HyperV on Server 2012 has no clue about the VMs in former Server 2012. The virtual machines have to be imported manually. This can be done using the HyperV console. First, provide the folder where the virtual machine configuration is placed. Afterwards choose to directly register the VM. Next provide the folder where the virtual hard disk files are placed. Don’t get confused because you don’t see the actual VHDX files in the selection dialog. The import wizard will check if the virtual hard disk named in the configuration file can be found in this folder. If the wizard can’t find the virtual hard disk file, take a look a the list of vhdx file paths generated by the PowerShell script. When all the VMs are imported the upgrade is almost finished. The the network connection of the virtual machines and make sure they can access the network via the newly created virtual switch. Removing the virtual network adapter and adding the virtual network adapter again can help Perform some tests, maybe reboot the server again and install the latest updates. 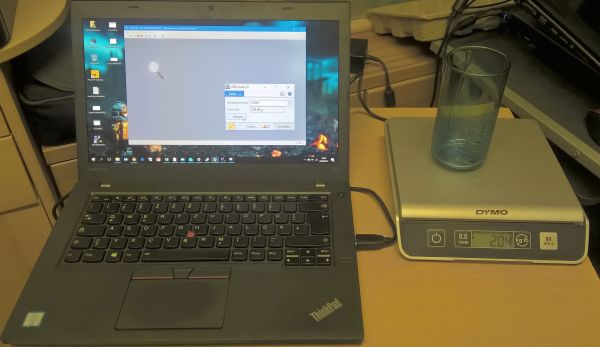 I was recently playing with an Dymo USB scale and how to connect it to a Dynamics AX 2012 instance on a virtualized HyperV installation. It turned out that connecting these two is not so hard at all. The Dymo scale was immediately recognized by my PC. Some code is needed to access the scale. Fortunately, there is a code snipped available here: http://r.lagserv.net/scalereader.htm . Create a Visual Studio C# DLL Project. Copy the code for the USBScale class from the website. Add the previous built HIDLibrary to your projects references. 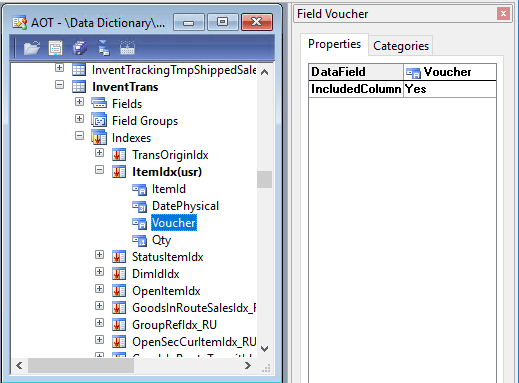 Add two int properties to the class, for Vendor ID and Product ID. 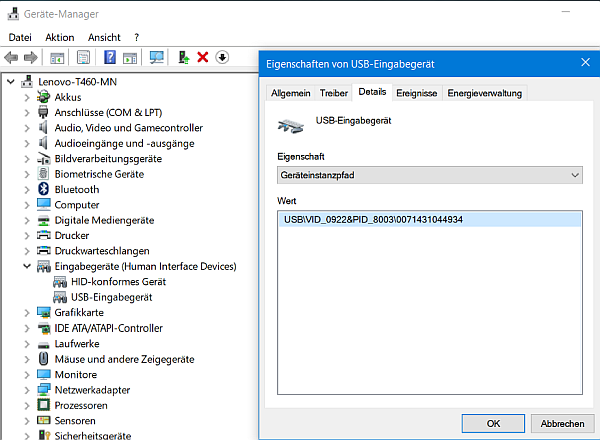 There are different ways to pass an USB device to a virtual machine. However, I was using a tool called USB Redirect which is available as trial version for testing. It has two components. The server which manages and shares the USB devices is installed on the physical machine. 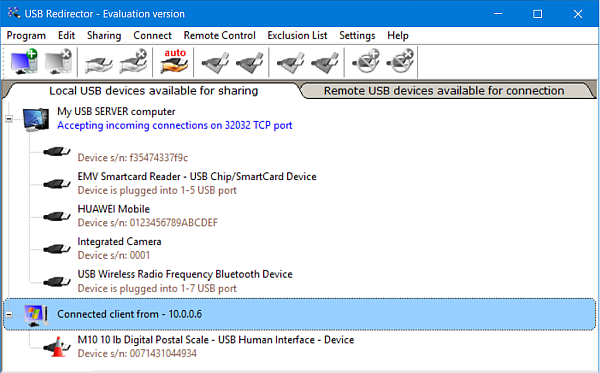 The client is installed on the VM and can access the USB device at the physical machine. 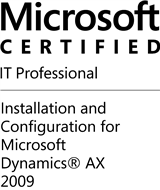 Finally, the last step to integrate with Dynamics AX is easy. Copy the HID Library DLL and the USBScale DLL to the client bin folder. Create a form with a Scale button. At the clicked() method create a new instance of the USBScale class, provide your product and vendor ID and call GetGramm(). The cluster index can be defined using multiple fields and is used to defined the order of records stored in the table. 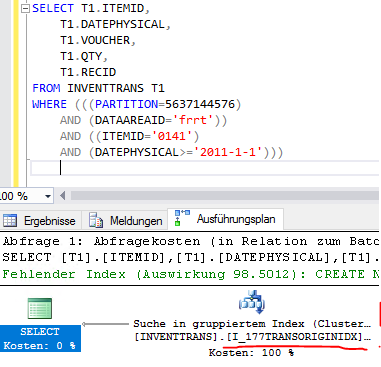 Even more important is the fact, that if a table has a clustered index all the data is stored in the table, i.e. the cluster index IS the table! 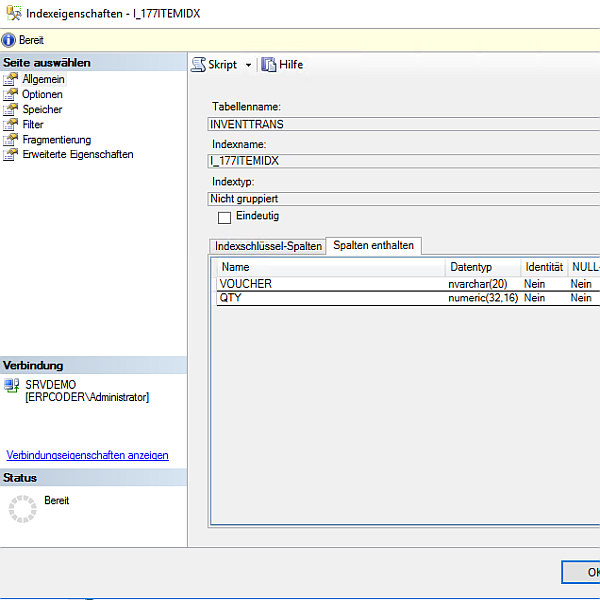 When the query selects fields which are not part of the index, SQL server has to perform a lookup in the Cluster Index for each record identified by the ItemIdx to get all the other fields. For example the Voucher and Qty are not part of the ItemIdx. This can get even worse, when performing the lookup becomes to expensive. This can happen when the query returns a larger number of records. For example, when querying for another ItemId. 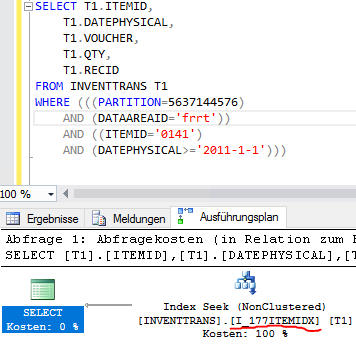 In this example SQL server does not use the ItemIdx anymore, but performs a search in the clustered index instead. The ItemIdx became completely useless for this query. 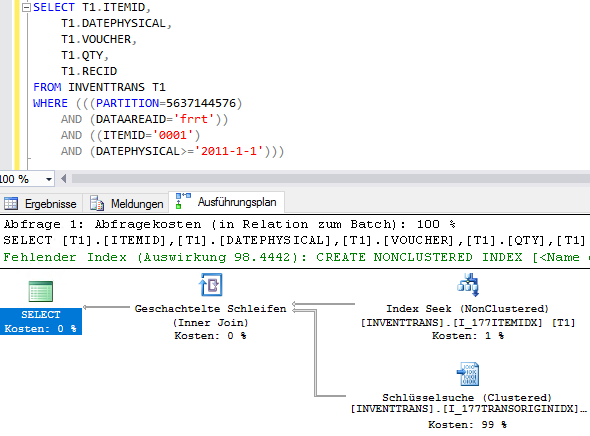 SQL server required 1345 logical reads to fetch the data! 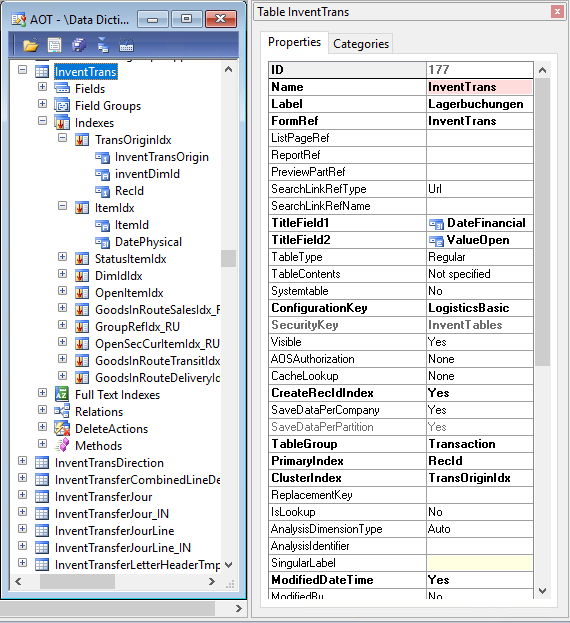 Since version 2012 Dynamics AX supports the definition of Included Columns for indices. These columns are not used to sort the index. These are just fields which are stored within the index to avoid costly lookups in the clustered index. In Dynamics AX you just add columns to the index and set the property IncludedColumn to Yes. 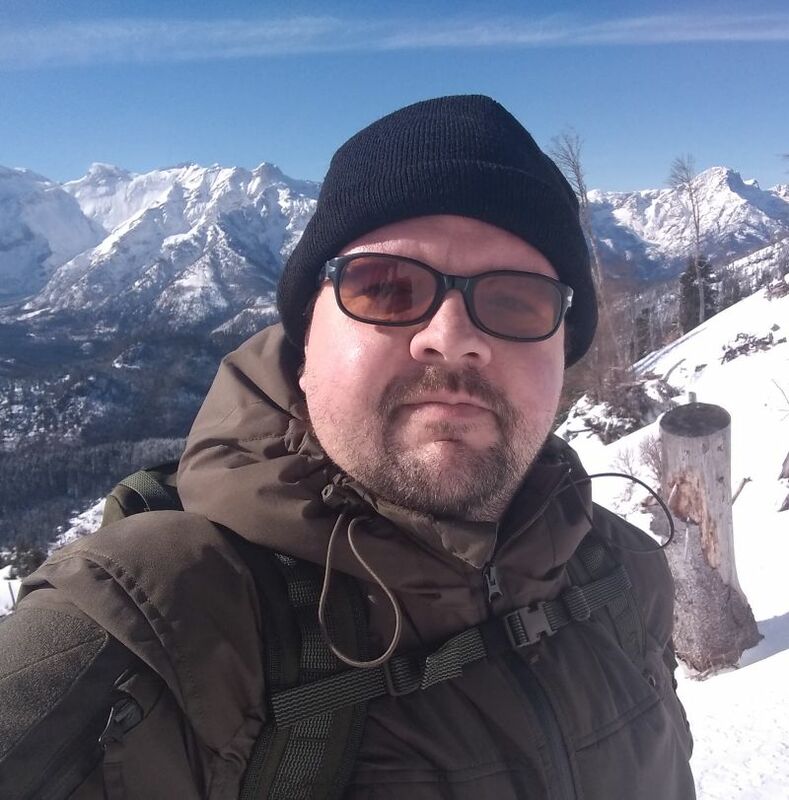 When the statement from above is executed again, SQL server can use the included columns from the index and does not perform costly lookups in the clustered index. Only 6 logical reads are required to fetch the data. This is a huge optimization compared to the 1345 reads without included columns.